Call it Deviled ,devilled, or Angel, once a raging success that adorned mighty banquet tables is so-totally making a comeback this Christmas season! These canapes are so incredibly easy to whip up and it’s just the perfect choice to get the party going on an epic note! 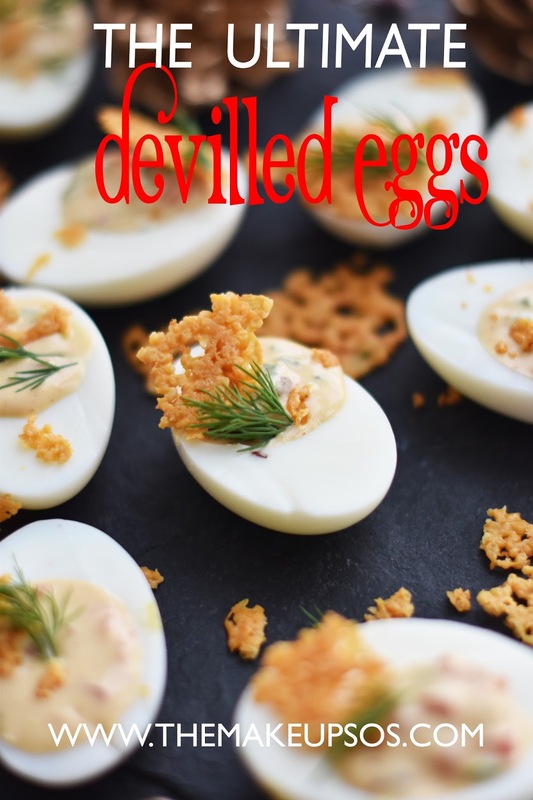 Read on for our pimped-up version of Devilled Eggs! Boil the eggs in a large sauce pan, Once done cover it with some cold water and let it rest for a bit before you remove the shell. Peel the shell once its cooled down and scoop the egg yolks into a bowl. In a pan you can fry up the bacon till its crispy and golden. I kept the capsicum raw to add some freshness to the dish and to cut through the richness of the creamy eggs. Blend the egg yolks,mayo,paprika in a mixing bowl,tip in the capsicum and the prepped bacon into this. Check the seasoning and add salt and pepper if need be. Once done you can transfer the creamy mix to a piping bag. It’s Christmas and it’s only fair to adorn the delicious eggs with some ornate tuiles! Grate some chees into a large baking tray lined with baking parchment. I went for bangle sized circles you can absolutely go for smaller proportions. About 8 mins of oven time and they will turn into a beautiful-golden-mesh. I would recommend keeping an eye on these, as even an extra min can cause it to burn! Once its out of the oven, leave it to cool for a few mins before garnishing. Now, pipe the creamy mix ,gently into the white egg shells. Place the golden tuiles and some fresh springs of dill to garnish it –and hey Presto, that’s job done! We would love to hear about your go-to Christmas recipes! 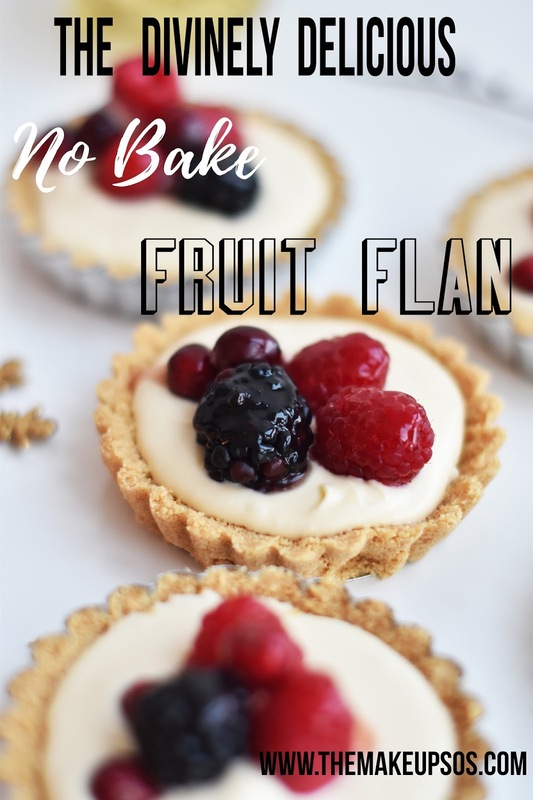 The Divinely Delicious No Bake Fruit Flan! With joyous Christmas just around the corner, we bring you the lazy Chef’s Ultimate Dream come true-The Divinely Delicious No Bake Fruit Flan! With little or no effort( wink wink) and some very-berry razzle dazzle you are done and dusted and out of the KITCH! !This is such a crowd pleasing number,that will leave the gang wanting for more! Read on for the supremely easy recipe! All that you need is some biscuits and some jolly good Christmas tunes. · In a large food processor ,finely grind the milk biscuits and the digestive biscuits. Move the biscuity powder to a large mixing bowl and slowly mix in the butter till you have a pliable –almost sand like mix. The consistency you are looking for is a slightly wet powder that will hold its shape when you hold the mix in the palm of your hand. · Now line the utensil of your choice, with the mix, you need to pack it nicely so that it will hold its form when you cut into it. · Once done, place it in the fridge for about 15-20 mins to help the casing to cool down and set. · Now you can whip up some cream or use some delicious brandy cream , it’s the season of indulgence after all;) to line the tart cases. · Top it with the fresh berries and Ta-dah your dessert is done! PS: As I went for Brandy cream it was already sweetened, you can add some granulated sugar if you choose to use whipping Cream instead. Another easily available option is the good old Custard,It works really well with the biscuity crust. Oia and the Magnificent Yellow Dress! Like many of you, My heart and summer-loving soul is deeply yearning for some divine gleaming golden hues, with incessant rain, blow-me-away winds and with much winter chills, the weather situation has been pretty murky here in London ! Hold tight, Now, I have just the perfect trick up my sleeve ;) to sort the deepest winter blues! Ha! Get ready to bask in the most unadulterated sunny rays, immerse in the sultry-ness of the Aegean waters, and absorb the amazing –breath-taking panoramic views of Oia. Yes, it is a delightful summer party-Woot Woot! Belinda Carlisle, was absolutely right about Heaven Being a place on earth, Of course, It was Oia, she had in mind ;) . With cobbled windy streets and myriad white cottages with rickety- Blue Panes,the rusty church bells with picturesque domes and delightful bursts of Pink bougainvillea- and spectacular sunset views- Oia is truly magical and one of its kind! And the magnificent yellow Dress! Ladies, let’s take a moment to appreciate the exquisite dress! Yep – its 200% magnificent! 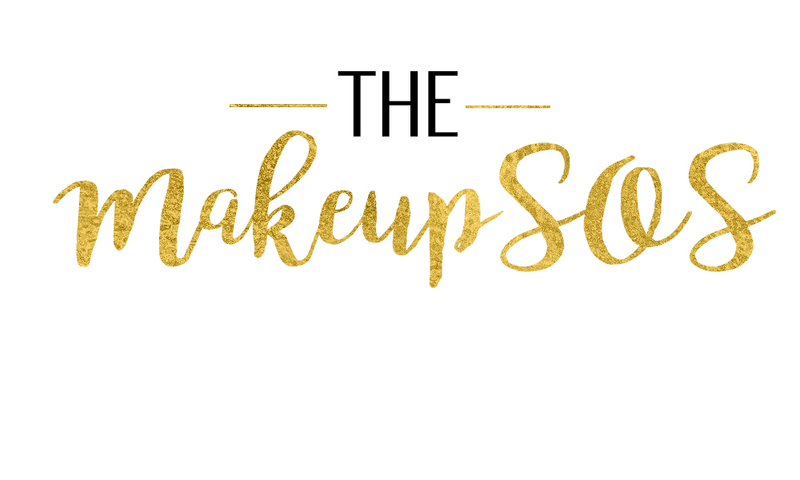 This little burst of sunshine was packed with a lot of love and much thought and travelled miles from far, from a very dear friend and a MakeupSOS favourite-designer Janki Prakash! And in truest of Janki’s ways, it was yet another stunning design from the Label! With immaculate drapery, the soft shimmery silhouette encompassed me with absolute ease, swayed and revelled in the light beautiful breeze of Oia and with flying locks – it did have a bit of Bollywood Production flair to it :D! When other designers would brush off a mundane monotone option, Janki begged to differ. The colour picked out with bullseye perfection, The yellow was an absolute jubilation and enlivened the picturesque scenery with ease.I truly felt like a Greek Goddess of some sorts :D ! Fashion truly champions being fearless and exploring beyond the familiar. And at the other end, beyond the comfort and warmth of familiarity is creative freedom and genius-ness! And our young Janki, is daringly adventurous and charmingly dauntless, quite easily established with the amazing criss-cross back detailing Janki gave to the outfit, Even the littlest aspect, thoughtfully realized. Gladiator sandals seemed much suited for the opulent outfit and some delicate layered jewellery added, to finish the look! In a recent Interview the much renowned actor Sarah Paulson was quoted saying,‘‘Let your freak flag fly!.....let yourself be..YOUSELF.There is only one you in the world..Let her out”, and your flag is flying ever so high Janki, it’s amazing to see you evolve and we are truly proud of you! I can easily go on and on and cite a million reasons for loving the dress and as for you Janki :) You are truly INCREDIBLE and I am filled with gratitude and much love and really (like really) Can’t thank you enough for the best outfit I have ever owned! And to stay-all-tuned-and-all- updated on this diva’s exciting affairs follow her along at @jankiprakash on Instagram and @Sreelakshmi Prakash on FaceBook. Nothing beats the comforting feel of a heavenly-indulgent chocolate cookie on a cold wintry night,We have the ultimate chocolatey –Brookies that’s delightfully easy to whip up - simply put- it’s absolutely EPIC! Place the blocks of chocolate on a double boiler until it melts add the butter to the melted mix and combine with the chocolate mix. In a separate mixing bowl blend the eggs and sugar along with the baking powder and vanilla essence and the cornflour. Before you add the melted chocolate mix ,make sure it’s not hot, as it can cause the eggs to split. Scoop the slightly melted peanut butter and create some whirls in your batter, the Peanut butter really helps to tone down the sweetness of the mix. Line some backing parchment on a flat baking tray and scoop the chocolaty mix onto the sheet. Leave some space between the brookies as they beef up in the oven. Gingerly place the choco-chips on top of the brookie and its all set to be baked! Each batch takes 8-10 mins. Once the brookies come out of the oven, allow it to cool down on a wire tray and when you break open you will be greeted with a soft-cakey inside and heavenly cookie-like outside. I truly hope you guys enjoy this one !